100% Polyester- Visor: 100% Cotton. 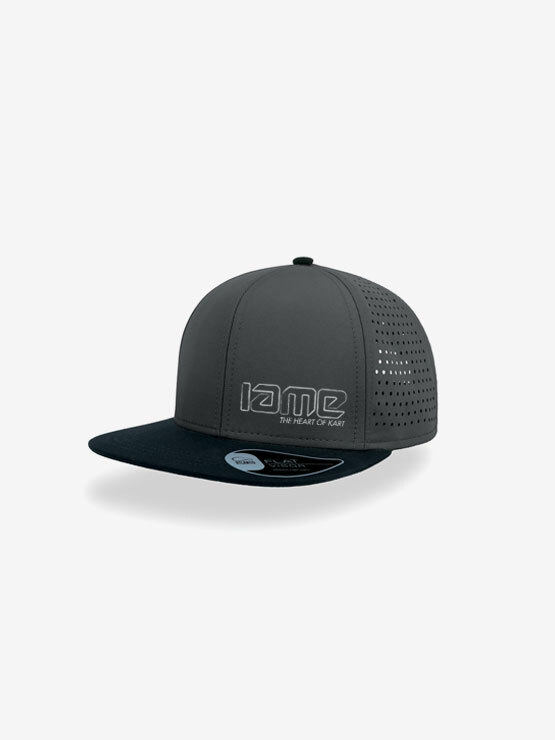 6 panels cap with flat squared visor, 4 stitchings on visor, PVC closure, one size fits all. There are a few important things to keep in mind when returning a product you purchased. You can return unwanted items by post within 14 (fourteen) days from the date they receive the products they ordered. Unlead di Gabriele Giudici, via della Pace, 52, 20020 Lainate (MI) Italy. Foggy is a light concept official IAME t-shirt. Very casual, you can wear it in many situations, to always carry The Heart of Kart with you. The quality of the 100% cotton t-shirt represents the high quality standards required by international regulations. The shirt has a young cut and slim fit, so we recommend checking the size in the appropriate table. The processing consists of a light vinyl specially designed and imperceptible, fixed with high heat and strong pressure. Thanks to this treatment we guarantee a long life and perfect washability. Army by IAME is an aggressive shirt with a khaki background and gold print. Its meaning is aggregative, because being part of IAME means living one's passion along with many other valiant drivers. The quality of the 100% cotton t-shirt represents the high quality standards required by international regulations. The shirt has a young cut and slim fit, so we recommend checking the size in the appropriate table. The processing consists of a light vinyl specially designed and imperceptible, fixed with high heat and strong pressure. Thanks to this treatment we guarantee a long life and perfect washability. Sunset is an official IAME t-shirt made from a warm and soft orange cotton. The quality of the 100% cotton t-shirt represents the high quality standards required by international regulations. The shirt has a young cut and slim fit, so we recommend checking the size in the appropriate table. The processing consists of a light vinyl specially designed and imperceptible, fixed with high heat and strong pressure. Thanks to this treatment we guarantee a long life and perfect washability. League is an elegant and warm sweatshirt that adapts perfectly to the shape of the body. The cut of the pockets is in thread, with an invisible effect, and the zipper is in metal with a very resistant golden effect. League is made of 80% cotton and 20% polyester, with plush interior and well-fitting elastics. The seams are external, and mark the person's body well. The processing is made of vinyl material applied by pressure and color, to ensure resistance and durability. Scudetto is a high-necked sweatshirt with full zip, 50% cotton, 50% polyester. The welt pockets give an elegant look, without upsetting the shapes. The neck is made of the same fabric. high-strength zipper and tone-on-tone quality with metal elements, to remain discreet and secure. Scudetto is a soft sweatshirt with a young and gritty cut, with a fresh and sporty design. The prints are made of light vinyl material and strength, to be visible and washable, without weighing down the fabric. The "shield" shirt by iame series represents the most visible version of the official line of cattle dedicated to individual national competitions. The quality of the 100% cotton t-shirt represents the high quality standards required by international regulations. The shirt has a young cut and slim fit, so we recommend checking the size in the appropriate table. The processing consists of a light vinyl specially designed and imperceptible, fixed with high heat and strong pressure. Thanks to this treatment we guarantee a long life and perfect washability. This is the official IAME Karting store. Welcome! This store is managed by UnLead, a brand strategy company wanted by IAME, to take care of the design and online sales of this platform.